I had a very early appointment this morning that took much longer than I had planned. As I prepared to exit the building my mind was taken up with all of the annoyances of the day and how this appointment had put me very far behind. Then I stepped outside and breathed in the amazing day. The air was clear, the sun was shining, and the temperature was perfect. I just stopped where I was, closed my eyes, and breathed it all in. I realized that I needed to let the morning go. It was past and I was looking forward to what the rest of the wonderful day was going to bring me. It made me realize how often we get stuck in the past. 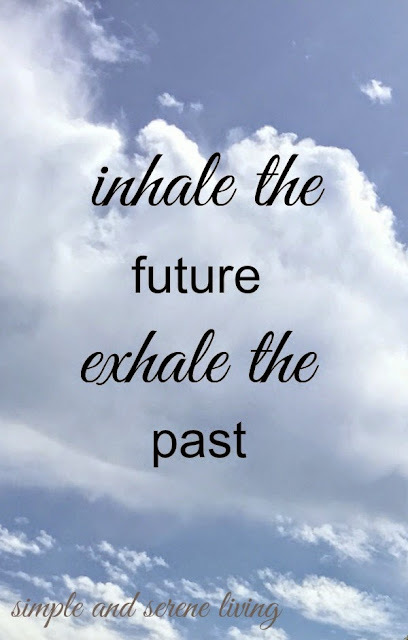 How we let the past cloud our days. How we need to let it go and look to the future. So that is the main thing on my agenda today. Yes, there is a long list needing my attention, but I am going to tackle it with a fresh outlook while I inhale and exhale. P.S. Be sure to check out more Monday Inspiration. Truly breathing - deep inhales and exhales - are so important. Usually we do such shallow breathing that we don't even realize it. Sometimes we even hold our breath. Not good! My yoga teachers always remind us of our breath. Inhaling here, fresh country air, laced with the scent of spring, and birdsong...good reminder Laura. I really needed my time in the garden today...and your beautiful words. I have scrabble letters in my home that spell "BREATHE"! Thanks for the reminder to just "breathe". Thanks for the advice Laura. I have to confess that I'm one of those who sometimes hold their breath. I'm working on it though. I love this post! I have trouble relaxing after something doesn't go my way. It messes up my whole day. This is a great reminder to not let that happen and leave the past in the past! I think that will be my new mantra. Glad that you were able to do that with the rest of your day too.